With approximately 1 in 6 adults likely to experience a significant mental health problem at any one time (Office for National Statistics), research into effective interventions has never been more important. During the past decade there has been an increasing interest in the role that sport and physical activity can play in the treatment of mental health problems, and in mental health promotion. The benefits resulting from physiological changes during exercise are well documented, including improvement in mood and control of anxiety and depression. Research also suggests that socio-cultural and psychological changes arising from engagement in sport and physical activity carry valuable mental health benefits. Sport and Physical Activity for Mental Health is an evidence-based practical guide for nurses, allied health professionals, social workers, physical activity leaders, and sport coaches. The authors provide comprehensive analysis of a broad range of client narratives, integrating theory and the latest research to explore the effectiveness of various interventions. 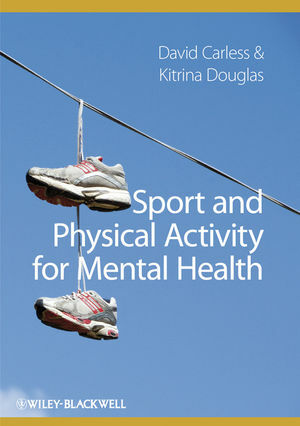 The book offers readers detailed recommendations, suggestions, and ideas as to how sport and physical activity opportunities can be tailored to provide the greatest mental health benefits. David Carless, Ph.D, is a Senior Research Fellow in the Carnegie Research Institute at Leeds Metropolitan University. Over the past decade David has used a variety of narrative and arts-based approaches to explore mental health, psychological well-being, and identity in physical activity and sport contexts. His research has been published in international journals such as Qualitative Research in Psychology, Issues in Mental Health Nursing, International Journal of Mental Health Promotion, Psychology of Sport and Exercise, International Journal of Men's Health, Psychiatric Rehabilitation Journal, and Qualitative Inquiry. Kitrina Douglas, Ph.D, is an Honorary Fellow in the Department of Exercise, Nutrition, and Health at the University of Bristol. Kitrina played professional golf for twelve years during which time she gained a variety of coaching qualifications including being awarded "Master Professional" status by the Professional Golfer's Association. She has worked in broadcasting and the media and, since 1996, has conducted research in the areas of sport, exercise, and mental health. She has published in a variety of journals including The Sport Psychologist, Journal of Applied Sport Psychology, Reflective Practice, Qualitative Research in Sport and Exercise, and International Journal of Sport Science and Coaching. 1 A background to mental health and physical activity. 2 A narrative approach to mental health research. Part II: Understanding physical activity and sport in mental health. 3 Personal stories of sport, physical activity and mental health. 4 Rebuilding identity through sport and physical activity. 5 Action, achievement and relationships. 6 Physical activity as a stepping stone in recovery. Part III: Practice and provision of physical activity and sport. 7 The culture of physical activity and sport. 8 Women in sport and physical activity. 9 Social support for participation. 11 A story from practice. 12 Looking to the future.